Vancouver Island’s greatest discoveries may lie beneath the rainforest and mountains it is most known for. When I arrive at Horne Lake caves, I’m warned by the guide that “it will be wet”. Myles leads us to Main Cave. Barely a crack in a cliff wall, the entrance is a tight squeeze point before opening up. As we move deeper in, surface light fades and any sense of direction blurs. Narrow passages expand into larger caverns in unexpected directions. A waterfall crosses the path, somehow disappearing into a rock wall. From the surface, it’s hard to imagine anything like this existing beneath. Yet there are over 1,200 caves on Vancouver Island. They stretch out for hundreds of meters, and larger caves are over 10 kilometers long. Deep within each of the tour’s three caves, we stop and turn out the headlamps. The surface immediately seems distant. Instead of being unnerving, the sensation of absolute darkness enables a variety of sensory experience. Within one cave, a member of the group leads a short meditation, helping us concentrate on our connection with the earth. We are deep within or simply allowing our thoughts to wander. In the second cave, when the lights go out, I dance on the spot. No one notices. Being pitched into the earth without natural light instills an overwhelming feeling of vulnerability. As the guide describes how easily this delicate Karst ecosystem is affected by surface actions, I appreciate the sensitivity of the cave environment. Calcite formations are scarred brown by a careless touch. Hollow “soda straw” stalactites formed over centuries break with the slightest nudge. The world does not stop at our feet; an entire ecosystem expands deep below the surface. Caves operate on a different timeline, greatly exaggerating damage. Growth rates of geological formations are measured in fractions of millimeters per year. The towering forest on the surface is young compared to the short stalactite hanging above. The underworld is greatly affected by life above ground. Caves change seasonally. Underground rivers surge during wet winter months, while dry summers allow for easier, deeper exploration. Beneath us all, the gateway to a rarely seen and entirely unique ecosystem awaits. 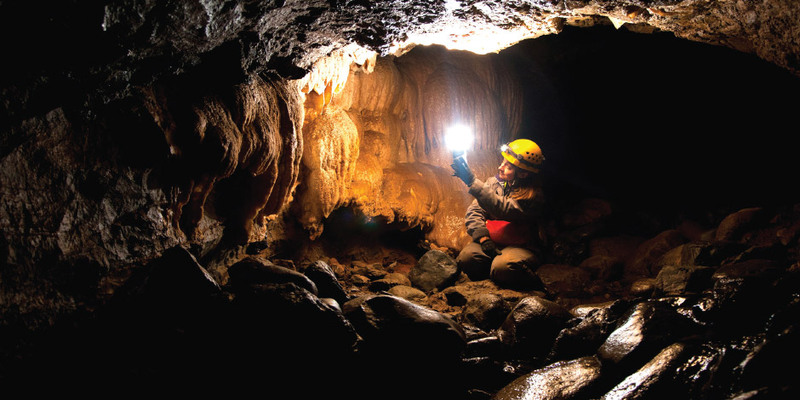 Horne Lake Cave Tours was recently awarded a Remarkable Experience Award by Destination B.C. for Vancouver Island caving. Visit hornelake.com for more.